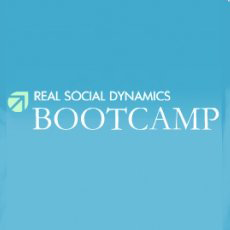 Review for Real Social Dynamics Bootcamp, It Was Awesome! Hey guys, I just got back from a RSD bootcamp in San Fran. Unlike alot of people's experiences mine was awsome, I learned alot from it. One of the reasons was because my instructor was really into it and knew sooo much. I had Jlaix as my instructor and there was only one other student there so it was very individualized and intense. The first night was really hard and I wound up questioning why I had traveled across the country to be there. We went to a lounge and a club to open up sets with nothing but a couple of openers. I struggled the whole night getting blown out of almost every set I approached. Jlaix really pushed me hard and I was at my limit as far as approaching and also getting blown out. After the clubs we met up and got really good feedback and I started to feel a bit better. The second night was the best, we finally got some material and also a game plan. That night Jlaix spent about 4 hours going over material, game plans, and the most important internal state. That night I opened sets and almost every single set i opened hooked and was into it. I even approached a hb who I would have never approached and got a number close. Jlaix told me I could have easily pulled her if I had used kino at all and that alone drove me to get a pull for the rest of the night. Through out the night I wound up getting another number close while the other student got a make out and a number close. That night I felt great about myself and what I had accomplished. The next day we went out and went over style and day game. I approached a lone wolf at a mall food court and once again could have pulled but I didn't use kino and she left. In the end this was an amazing experience and I would highly reccomend a RSD bootcamp because I learned soo much from it and now feel as if my life will be completely different as a result. What's kino and how I get it?